The beautiful town of Niagara-on-the-Lake in Ontario has a rich history and this is evident in its monuments and historical sites. Fort George, a National Historic Site of Canada, is one such military structure that was built by the British along the Niagara River. It was a hub of military activities and the site of several battles during the War of 1812. Today, the reconstructed fort maintained by Parks Canada stands proudly in its magnificent location and serves as a museum that takes visitors back to the 19th century. You can take a tour through the eight restored buildings here and check out the internal structures. Take a look at the living quarters including those of officers and other ranks who lived here with their families. Signage provides information about various aspects of the fort. On the opposite side, across the river in New York, visitors can see Fort Niagara. The British built Fort George as they wanted to reinforce their stronghold over Upper Canada. Construction was completed in 1802 and the fort became the headquarters of the British army. The impressive fort had earthen and log bastions connected by a wooden palisade with a dry ditch all around it. Everything that the armies needed to live and survive in the fort was built here– barracks, officers’ quarters, log blockhouses, workshops, a hospital, kitchens and a guardhouse. One original building still stands there after all these years–an expertly built stone powder magazine. 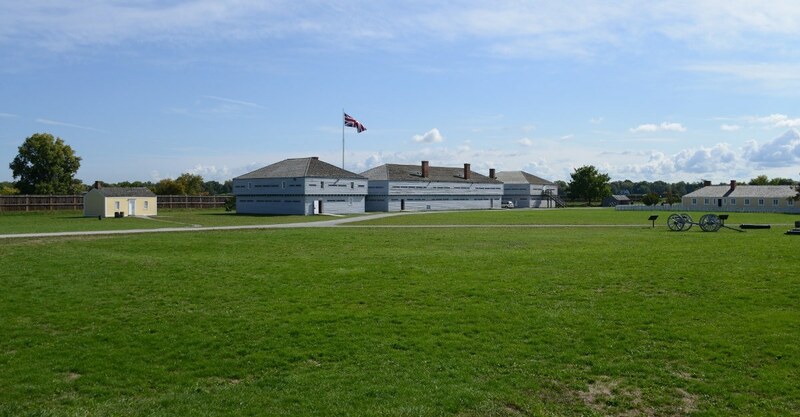 Fort George functioned as the headquarters for the Centre Division of the British Army during the War of 1812. The forces here battled to defend Upper Canada against the United States. But American artillery fire led to the destruction of Fort George in 1813. The U.S forces captured the fort and used it as a base for the next seven months but it was reconquered and partially rebuilt by the British. Unfortunately it fell into ruin by the 1820s. The years after that saw the site being used for various purposes including as a military training base for the two World Wars. Subsequently, the plans for reconstruction took shape and today the wonderful fort is a great place for visitors to travel back in time. The fort comes alive today with re-enactments of the war. You can watch soldiers in red coats firing muskets or you can actually be one of them. The re-enactment shows British soldiers looking on while their sergeant speaks about the Brown Bess musket used in the war of 1812. Then following the procedures, the men raise their guns together and fire. The loud sounds, the flames that flare up and the black powder enveloping the air, transport you back to 1812. If you want to be in the thick of the action, Hands on History allows you to don the smart uniform and fire the Brown Bess musket, feeling every bit like a patriotic soldier. Military music from the Fife and Drum Corps and Band of Music enhances the atmosphere. Truly, a trip back in time!